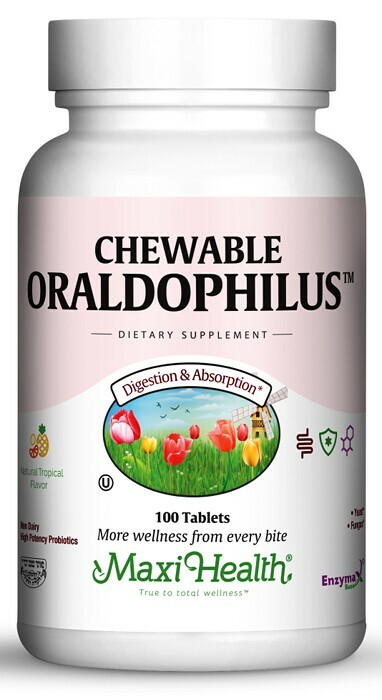 Chewable Oraldophilus™ has both of the most important probiotics that you need! Lactobacilius acidophilus (providing 1 billion culture forming units) and Bifidobacterium Bifidum (providing 1 billion culture forming units) which can replenish and even enhance the correct quality and quantity of healthy bacteria lost. Chew one (1) to three (3) tablets daily before meals, or as directed. Mannitol, maltodextrin, stearic acid, natural strawberry flavor, magnesium stearate, natural banana flavor, cranberry concentrate, Enzymax® (calcium carbonate, bromelain, papain, lipase, amylase, protease, silica), sucralose, modified cornstarch, magnesium hydroxide, dextrose, propylene glycol, glycerin, sodium citrate, acacia gum. My brother often as strep. Between that and the medication he is often weak after it. Maxi Health's Chewable Oraldophilus helps him bounce back.